Elizabeth Haynes captivated me with her novel, Into the Darkest Corner, and I have enjoyed her series featuring Detective Inspector Louisa Smith. 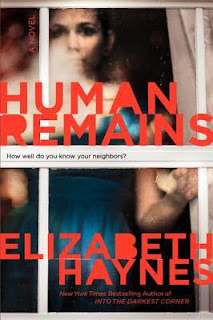 I was eager to give another of her books a try, and dove into Human Remains with high expectations. While it isn't my favorite of her novels that I have read so far, I did enjoy it. Like her other books, she tackles a subject that the reader just can't help but think about in terms of their own lives, wondering what if. I found Human Remains to be disturbing in more ways than one. Less a mystery where you have to guess who the bad person is, and more a thriller where you know up front (or close to it) who is up to no good, the novel jumps from the viewpoint of the perpetrator to the police analyst, Annabel, who discovered the decaying body of her neighbor, interspersed with sections written from the perspectives of the victims, each one a troubled soul who makes an easy target for a man like our perptrator. Getting into the mind of a psychopath can be quite interesting and is always disturbing. This one is no different. He believes he is providing a good service, helping people down their chosen path. Just being in his head sent shivers down my spine. It was hard to imagine he could be good at what he did and yet he was. Too much so. Annabel herself is a bit lost. She lives alone with her cat, doesn't really have any friends, and takes care of her ailing mother who also lives alone. She is the one who initially notices the alarming increase in deaths in the community and begins to look into why. I felt for her. I know so few of the neighbors living on my street. I admit much of what I do know is thanks to my next door neighbor who knows everyone else. He's extremely friendly and social, something I'm not. At least not the social part. The neighbors on the corner we are familiar with because they have a son my daughter's age. We wave to the other neighbors on our street in passing (although there is one family across the way that doesn't wave back), but we really don't know each other beyond that. If someone were to die, alone in their house, I am not sure I would notice. We all come and go, living our own lives. It's sad to think about. I remember growing up in neighborhoods in which everyone knew everyone. It was much different all those years ago. Do you know your neighbors? Like her other novels, Human Remains is on the darker side, perhaps her darkest novel of all. It is graphic at times, which may be off putting to some. It is both a disturbing and intriguing book. Source: Review e-copy provided by the publisher via Edwelweiss for an honest review. The cover of that book reminds me of Let the Right One In. Jeane - My husband and I are both introverts as well, and so we tend not to do anything more than wave. I'll stop and chat if a neighbor initiates it, but other than that, I keep to myself. I do think though that there has been a shift in our society as well to being more closed off. I thought that too about the cover! I'm glad I'm not the only one who thought of Let the Right One In. I think this is such a common problem today. Neighborhoods aren't the communities that they were in the past and there are lots of reasons for this, but still it is sad. I haven't read any of Haynes' books, but I'm adding this author to my list. Jenclair - I remember playing in outside in the neighborhood and everyone's parents were looking out for everybody's kids. It's so much different today. That book sounds like a page turner that's thought provoking. We live in a Charleston style neighborhood, with small lots, sidewalks, and front porches. Our neighborhood is very social - we have a social committee, book club, etc. so we know just about everyone here. Kathy - I love the sound of your neighborhood, Kathy! I wish we had something like that here. I agree with Jenclair that this seems like a common problem today. I remember during my childhood days we didn't even have to lock our doors and the neighbours seemed to know everyone within our community. I think it is sad; our technologies keep on improving but human relations have gone backwards instead. I'll definitely add this to my wishlist since I've enjoyed reading her other books so much. Melody - My dad used to get mad at me because I was always locking the door behind me when I came inside. He never understood the need for it. I think you are right about how forward moving we have been in technology and yet moved backwards when it comes to actual face to face socialization. I hope you like this one if you read it, Melody! Sounds good though I am worrying just how disturbing it actually is. Generally great characters, I do enjoy books that get into the head of the 'bad guy'. Tracy - This one didn't have me checking my locks multiple times like Into the Darkest Corner did, but it was disturbing just the same. It's always interesting to see things from the perpetrator's perspective, isn't it? Disturbing and intriguing sounds like one for my list Wendy. Diane - It was definitely both. I hope you like it if you read it, Diane.